NASA principals Raila Odinga and Kalonzo Musyoka in Joseph Kang’ethe Grounds Kibra, Nairobi, yesterday. Courtesy photo. 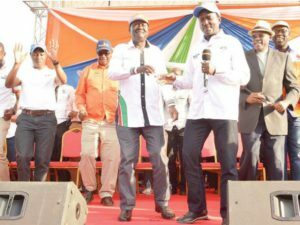 Two new surveys show that NASA Presidential candidate Raila Odinga has dramatically closed the gap on President Uhuru Kenyatta in the last one month. 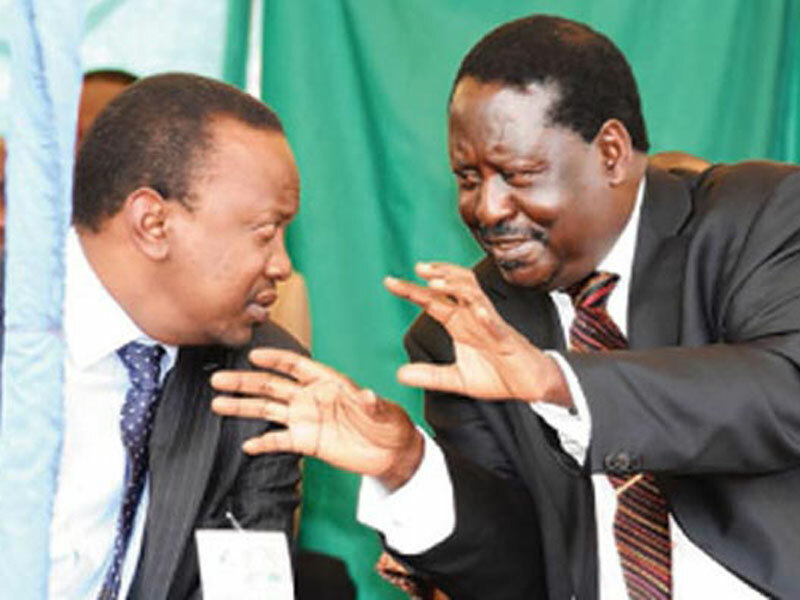 A Poll by Radio Africa Group indicates that Raila has narrowed the gap with President Uhuru, but neither of the two contenders would have an outright first round victory if the election were held today. The survey shows that Uhuru would lead the presidential race by 49 per cent against Raila’s 44 per cent if the election were held today, a five percent gap. An internal NASA poll done by an American research firm and seen by the Star puts Raila narrowly ahead of Uhuru by about a 1 percent point. From this report, which the Opposition will officially release today, Uhuru will score 46.7 percent while Raila will get 47.4 percent of the 19.6 million votes if the country goes to the election today. This, according to the international poll firm, is purely informed by Kenyans’ belief in Raila’s ability to guarantee economic growth. The NASA report also revealed a growing discontent among Kenyans, with 42 percent strongly convinced the Jubilee administration has steered the country on the wrong economic path and only 36 percent are comfortable with the current situation. “Unemployment tops voters’ concern at 56 percent, followed by corruption at 42 percent. The huge majority from both sides believe corruption has a large or moderate impact on unemployment (88 percent), cost of living (88 percent) and shortage of food (82 percent),” reads part of the internal poll report. Jubilee candidate Uhuru Kenyatta addresses a rally recently. Courtesy photo. On corruption, 46 percent of President Uhuru’s Jubilee supporters admit that the scourge has grown to cancerous levels in the last four years. Generally, 69 percent of those polled said corruption has become worse. Raila will also attract 47 percent of the undecided vote bloc, according to the NASA poll, buttressing his win over Uhuru, who will only manage 27 percent of the crucial undecided population. In the Radio Africa poll, seven per cent of Kenyans, which translates into 1.3 million registered voters, still remain undecided. Another poll by Radio Africa Group last month placed Raila at 39 per cent and Uhuru at 48 per cent. There are only 19 days left to the presidential vote and the likelihood of a runoff, the first in Kenyan history, is beginning to look real. The Constitution states that to be declared President, a candidate must garner a 50 percent plus-one vote of the total votes cast — and secure at least 25 percent of the votes cast in half of the counties. But according to the new poll of 3,549 respondents conducted between July 10 and 16, both Uhuru and Raila will win in half of the 28 counties sampled. The poll, however, suggest that Uhuru’s percentage score could drop slightly in his Deputy William Ruto’s Rift Valley backyard as compared to 2013. For instance, Uhuru would win Nandi county by 73 percent against Raila’s 16 percent. The President would garner 61 percent in Bomet against Raila’s 21 percent. Uhuru Kenyatta (left) and Raila Odinga share a light moment at a past event. In the 2013 polls, Uhuru garnered an average of 86 per cent in Kalenjin-dominated counties, with Bomet giving the President 92 percent of the votes. But in what may trigger alarm bells in the Opposition, the poll indicates that Uhuru has 31 percent support in Kisii against Raila’s 57 per cent. The poll also puts Raila’s ratings in Meru at a paltry 10 percent against Uhuru’s 86 percent. The National Super Alliance believes they have made inroads in Meru, while Kisii remains their political turf. However, the poll indicates that Raila will win in Kitui by 79 percent against Uhuru’s 18 percent. The ex-PM would also win big in Trans Nzoia, considered a battleground, by 77 per cent against Uhuru’s 16 percent. Raila would also win Garissa, by 56 per cent against Uhuru’s 32 percent. The survey was conducted using computer-aided telephone interviews and has a sampling error of +/-1.7 percent, with a 95 percent confidence level. The survey also shows that Uhuru remains the favourite among youthful voters, many of whom will be voting for the first time. The President has 49 per cent support against Raila’s 42 percent among youths aged 18-24, the new poll shows. Uhuru is also the favourite for youths aged between 25-28, at 48 percent against Raila’s 45 percent. However, Raila has the highest support from Kenyans aged between 30-34, with 49 percent backing against Uhuru’s 44 percent. According to IEBC statistics, there are 9.9 million registered voters aged between 18 to 34. This means that youths have a huge sway in the August 8 race for State House. The poll however indicates that male adults have equal backing for the two presidential frontrunners at 47 per cent. However, Uhuru has the strong backing of female voters at 50 percent, against Raila’s 40 percent. According to the Radio Africa poll, Raila scores highly in the fight against corruption and ability to grow the economy. Twelve percent of Kenyans said they would elect Raila to fight graft with another 40 per cent saying they would elect him to grow the economy. On the contrary, only 4 percent said they would elect Uhuru to fight corruption, with 22 percent saying they would vote for him to grow the economy. 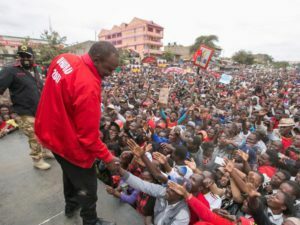 However, 55 percent of Kenyans said they would elect Uhuru to develop the country, with only 17 percent giving the same reason for preferring a Raila presidency. Both Uhuru and Raila are focussing attention on swing votes to consolidate their strongholds as the campaigns enter the homestretch. The plan by both candidates is to ensure that their strongholds turnout, almost to the last man and woman, to vote for them as they seek swing votes from battleground regions.